Remove heavy imperfections with ease! Similar to the Purple Foamed Wool Pad, but sheds less and cut better! 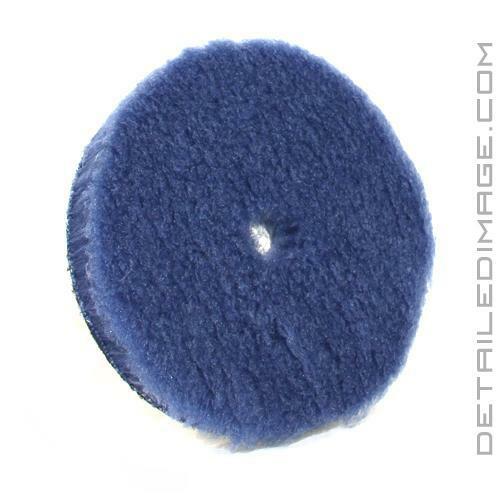 The Lake Country Blue Hybrid Foamed Wool Pad will make quick work of even your most severe imperfections! This pad is similar to the traditional Lake Country Purple Foamed Wool Pad, but it is packed with more foam at the core. This makes the pad much denser than the purple wool pad, but the unique composition allows this pad to shed less and cut better. These features help you leave behind a smoother finish with less haze, all while producing less heat. Pick up the Lake Country Blue Hybrid Foamed Wool Pad and get rid of severe imperfections quickly and easily! My Go To Pad After 50 Years Of Doing Paint & Body Work. The Best Pad I Have Ever Used. 6 inch Pad and A Flex 3401 Polisher Works Miracles On Major Paint Corrections On Texas Sun Damaged Vehicles. I am using Meguiars 105 Ultra Cut---Which Cuts And Finishes With No Need To Polish. But Leaves Too Much Dust For My Liking. Switching To Carpro Clearcut For This Reason Only---Should Cut And Finish Just As Good. Thanks Detail Image For A great Price On these Pads With Cheap And Fast Shipping. I have never used any type of wool pad before, but after reading good things about the LC blue foamed wool pad I decided to try it. What a difference from the red Meguiars cutting pad I had been using. The LC pad cut and finished very well. I was surprised at how easy it was to remove heavy swirls, much easier then with the Meguiars pad. The finish was much better also there was no hazing. I have only used this pad with Wolfgang Uber compound, and I am very pleased with the results and ease of use.